Wet classifier developed by making maximum use of the fluid analysis technology and control technology that we has developed over many years in mixing impeller development. With our newly developed rotor, it is possible to classify fine or coarse particle components with high precision. 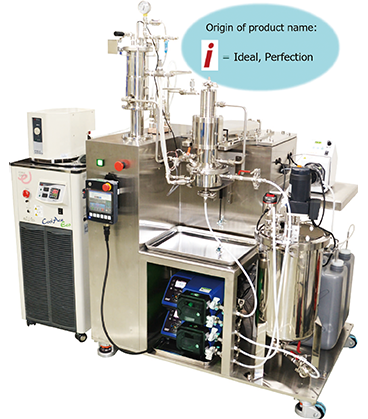 You can freely control the particle size distribution of all high added-value products such as fine chemical products, electronic materials, and pharmaceutical raw materials. We also accept sample classification performance evaluation tests. Please feel free to contact us. Currently, we do not sell outside Japan. We plan to start selling in 2020.
i Classifier can arbitrarily adjust the particle size distribution of submicron (several hundred nanometers) to single micron (several micrometers) fine particles present in slurry. Adjustment is performed by removing fine particles (small particles) or by removing coarse particles (large particles). Particle diameter to be removed can be freely controlled by the rotational speed of the rotor. i Classifier features removing with higher precision than conventional machines.